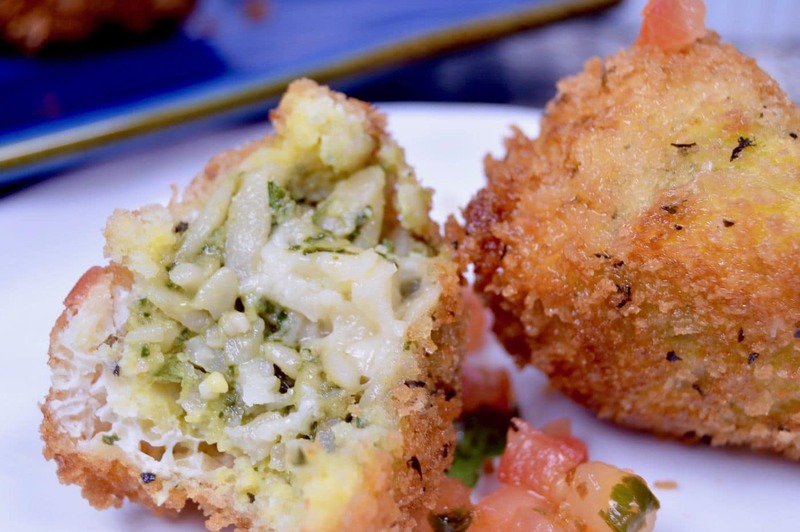 Pesto Pasta Cheese Stuffed croquettes are crunchy outside, oozing with melty cheesy pasta in the center. Warm, comforting and filling so you can easily make one batch for a party! 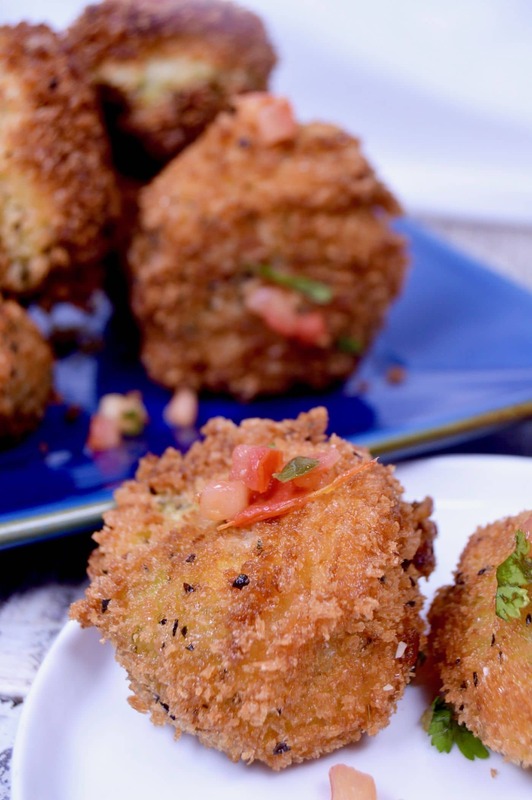 Pesto Pasta Cheese Stuffed croquettes have so much flavor going on in them. Leave it to the Italians to come up with another way to serve pasta! 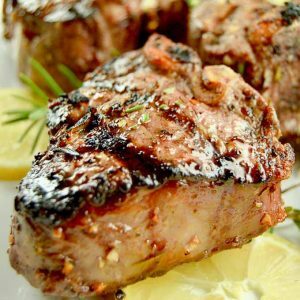 I had something similar to this recipe when we were in Italy a few years ago. I remember thinking it wasn’t quite arancini (aka risotto balls) but it was like a distant cousin to one. 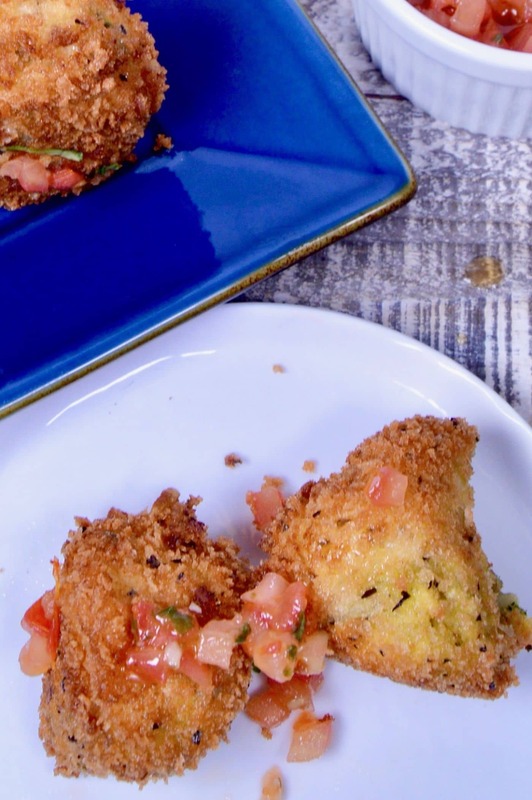 This version of Pesto Pasta Cheese stuffed Croquettes is a mix of both by using both pesto pasta with lots of cheese, then an extra cube of cheese for extra melty ooziness and then coats them in panko before frying. By using the panko bread crumbs, the croquettes come out a little lighter than using regular breadcrumbs. Easy/Hard: The croquettes are easy to make, but they are time consuming. A lot of time is spent chilling in the fridge but that step is important to have the croquettes stay intact so you can’t skip it. Make Ahead: You can make ahead up until the frying stage. If you have the balls formed and chilled you can dip them in the egg/panko and fry them when you need them. You cannot dip them and let them chill, because the egg will cause the panko to be soggy and you won’t get a crispy croquette. Wine Pairing: These go great with a Garnache red wine. The wine is not super heavy so it pairs will with the fried, pasta filled croquette. 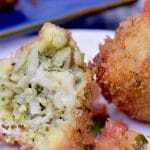 If you like this recipe you may also like my recipe for Arancini/Risotto Balls! They too have a melted cheese in the middle as well as bonus piece of salami. In a mixing bowl, add pesto sauce, pasta, 1/2 cup of the parmesan cheese, butter. Place a piece of plastic wrap over the mixture and let chill for at least an hour. 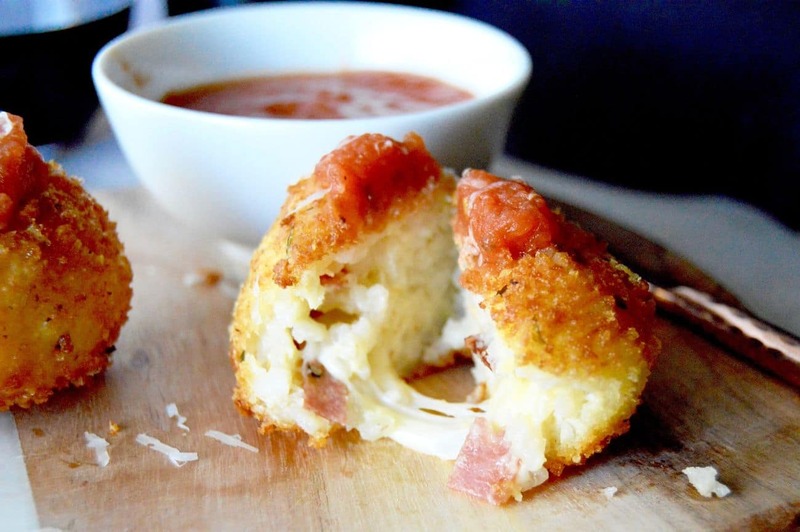 Using your hands, grab a golf ball sized amount of pasta, place the cube of mozzarella cheese in the middle and surround it completely. Form into compact balls. Repeat until all are formed, then chill again for one hour to set them. 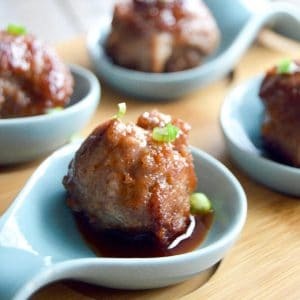 Once balls are chilled, take out two small bowls. In one bowl crack all of the eggs, remove and throw away shell, then mix until frothy with a fork. In a second bowl place panko breadcrumbs and add the remaining 1/2 cup parmesan cheese. Salt and pepper panko to taste. While the oil is heating up, take one ball, roll it in the egg mixture, then boll it in the panko. Repeat one more time in egg mix, then panko. Once the oil is hot, you will place balls into oil and fry, rotating so that all sides turn golden brown. About 10-12 minutes. Do not overcrowd the pan, it is better to fry in batches so that they all cook evenly. Once golden brown, remove from pan to a paper towel lined plate to drain off excess oil. Repeat until all balls are cooked. Allow to cool for 10 minutes before serving. Croquettes will have melted cheese in the center! Serve along side additional pesto sauce, tomato sauce or bruschetta for dipping. Caloric info was obtained using the brands/ingredients that I specifically purchased for this recipe. If you are following a strict diet, be aware the brands you purchase and use may have different calories than what I have used and plan accordingly. This recipe was inspired by the recipe from Pizzarium in Food and Wine. « Bacon Cheese Pastry Puffs! For last minute Entertaining! 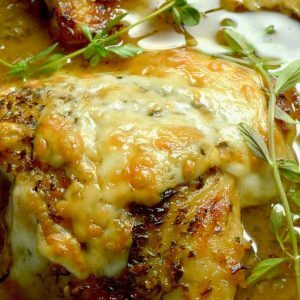 Such a creative and delicious recipe!! Saved! 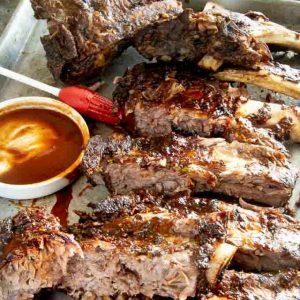 This is the perfect bite sized portion and easier way to feed a crowd! My stomach is literally growling. YUM! This satisfies so many of my cravings on SO many levels LOVE it!